High Flow Nasal Cannula for Infant is made of a lightweight tube, oxygen cannulas easily hook around an individual's ears and gently rest inside of the nostrils; the opposite end of an oxygen cannula connects directly to an oxygen concentrator or flowmeter. Smoothly finished & adjustable nasal tips for maximum patients comfort. 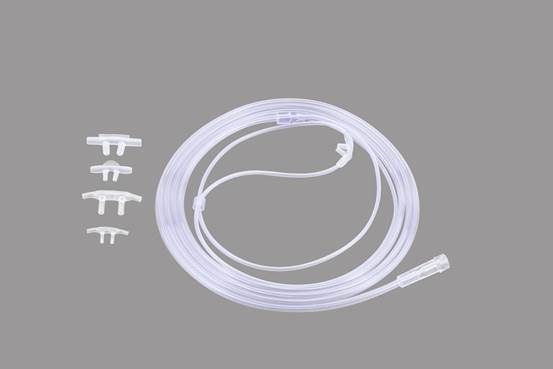 High Flow Nasal Cannula for Infant is made of a lightweight tube, oxygen cannulas easily hook around an individual's ears and gently rest inside of the nostrils; the opposite end of an oxygen cannula connects directly to an oxygen concentrator or flowmeter. Smoothly finished & adjustable nasal tips for maximum patients comfort. Soft funnel shape connector facilitates easy connection to the oxygen source. Twin prong nasal tips to ensure equal volume of oxygen to both air passages. Non-toxic, Pyrogen-free. We are one of the recognized companies in the trading the best quality range of High Flow Nasal Cannula for Infant. In addition, our R&D experts team are engaged in the research and development of new products to tailor our customers’ requirements and to perfect our services. 1. Attached the oxygen supply tubing to the oxygen source. 2. Set the oxygen flow as per the prescribed whit. 3. Insert the nasal tips into the nostrils passing the two plastic tubes over the ears and under the chin.